The two devices, based on Google's new video format VR180, are the Mirage Solo, the first Daydream headset that doesn't require a connected smartphone, and the Mirage Camera, an "aim and shoot" VR camera. During CES they were positioned as "simple and designed for anyone to use," provided that this "everyone" is ready to pony up $399 for the Mirage Solo headset and $299 for the Mirage Camera. Here's the teaser video for the headset provided by Lenovo during CES. 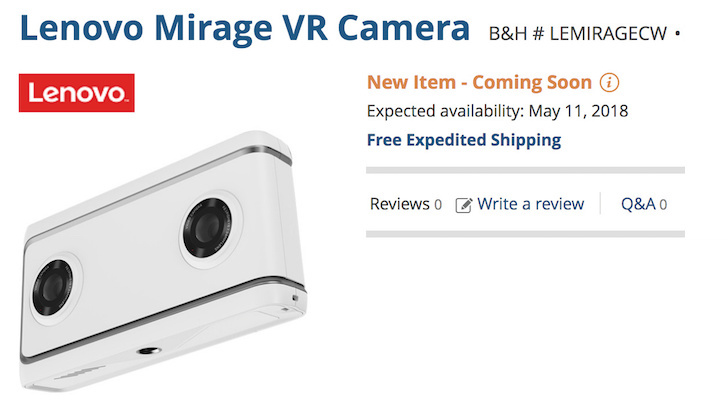 B&H lists the devices' availability as "expected" on May 11, but that seems a pretty solid date when one considers that Google I/O goes from May 8-10. Attendees on their way home from Mountain View can go right ahead and drop $700 on some sweet new consumer tech. Both devices are available for pre-order from B&H right now. Amazon also has listings for both products, but still classifies them as "currently unavailable."